Mannington Restoration Laminate floors give you performance and environmental advantages you won’t find anywhere else. It’s also truly beautiful flooring. Made with over 70% post-industrial recycled content and installed without glues or adhesives, Mannington Laminate floors have been independently tested and certified by FloorScore for meeting the strictest air quality standards.Mannington Restoration flooring offers the beautifully sophisticated look of reclaimed hardwood. It is further enhanced with SpillShield an awesome new technology that upgrades the flooring’s overall performance. It is exclusive to Restoration Collection laminate floors. SpillShield protects the floor from everyday spills and messes by resisting moisture. Having SpillShield on your Mannington Restoration Collection product sets a new standard for durability and performance. Mannington states that floors protected by SpillShield will not be damaged by ordinary spills and pet messes that are removed within 72 hours. Want to see Spillshield in action? Click here. With a refined yet rustic charm and amazing detail ingrained in each plank, Mannington Restoration Chateau Sunset (seen at left) is a beautiful weathered antiqued maple visual with a smooth surface. This pattern is sure to be stunning in any interior.These laminate planks come in at a little over 6 inches wide and 50 1/2 inches long. Featuring a subtle, hand-scraped texture, along with knots and saw marks, Sawmill Hickory has a lot of the characteristics found in wood. The natural beauty of an authentic rustic hickory is wonderfully replicated with the handsome floor. Plus the click system installation makes for easier work and you have a 25-year warranty with Mannington Restoration laminate plank flooring. 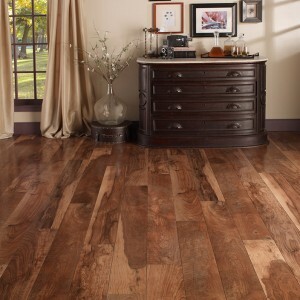 A Mannington Restoration Laminate Floor is the closest thing there is to a”maintenance free” floor. American Carpet Wholesalers is happy to help you make the right choice in flooring. If you have a busy household then the low maintenance of Mannington Restoration might be a good choice for you. The melamine-impregnated surface with aluminum oxide makes it resistant to dirt and dust. Ordinarily vacuuming or sweeping is usually sufficient to keep the floor clean. If needed, occasionally clean with a cloth or mop (microfiber or terrycloth hooded) slightly moistened with Mannington’s Ultra Clean System. 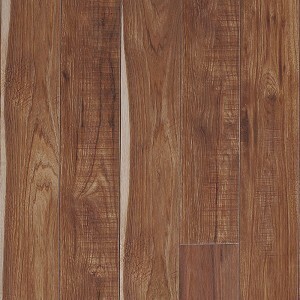 In all, Mannington Restoration laminate flooring is a great looking, easy to maintain the product. To make sure you get everything you need from flooring to accessories and more, give the flooring experts at American Carpet Wholesalers of Georgia a call. They can ensure you get the best deals when you call. The number to call is 800-548-2706.